On your 54th birthday you were adopted by a roaming, blue coyote with clear, amber eyes. You gave her my name, and taught her how to search the high mountain slopes for lost children and the bones of drowned hikers. Acrobatic, like the legendary trickster, our blue coyote leaps in and out of windows, entering our house and making it hers, then leaving again, taking my imagination with her. At first I was jealous, but now I see how easily a family can grow to encompass beings neither voiceless nor human. Our house has turned into a forest, with screeching, clown-faced birds weaving nests on the sofa, and a rainbow-hued cat emerging from my old flowered suitcase. Dogs of all sizes race from room to room now, while our blue coyote lies dreaming, curled beside the cavernous fireplace, offering sparks of memory, flashes of prehistoric flame. Margarita Engle is a botanist and the Cuban American author of three books about the island, most recently The Poet Slave of Cuba, a Biography of Juan Francisco Manzano (Henry Holt & Co., 2006). Short works appear in a wide variety of journals, including previous issues of VerbSap. Recent awards include semi-finalist selection for the 2006 Nimrod Hardman/Pablo Neruda Poetry Prize. Margarita lives in central California, where she enjoys hiking and helping her husband with his volunteer work for several wilderness search-and-rescue dog training programs. 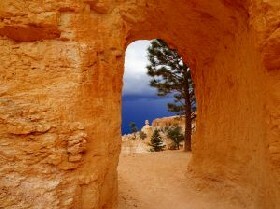 Photo "Bryce Canyon 2" courtesy of Steven Ritts, Cohasset, MA.